Can You Be a Meat-Eating Environmentalist? Sorry my friends, but it is getting harder and harder to be an environmentalist and consume animal products at the same time. As Kermit often says "It's not easy being green." No one said living by our principles would be easy. Probably the best thing we can do for the planet is abstain from meat, fish, and dairy. Our food choices have the most profound impact of all. More than driving a hybrid, recycling, solar panel installation or LEED architecture. So for all of our efforts, our carbon footprint is huge, thanks to our diet full of hamburgers, steaks, bacon and chicken salads. The energy it takes to produce a pound of meat versus a pound of vegetables is mind boggling. Meat eating is a biggie! It matters ... a lot. If we can't do it, how can we expect others with less resources (or information) to eat a more planet friendly diet? We must be the change we want to see in the world! What are we waiting for? We do not need to eat animal products to survive. The truth is we eat them because it pleases our palate. Nothing more. Meat/dairy/egg consumption is the real Inconvenient Truth for all of us who are conscientious eco activists. Animal product consumption destroys rainforests, the rivers, streams and oceans, the air we breath; it perpetuates world hunger and institutionalizes the suffering and outright misery for billions of animals. And animal feed is grown by intensive farming operations that use massive quantities of pesticides and herbicides. 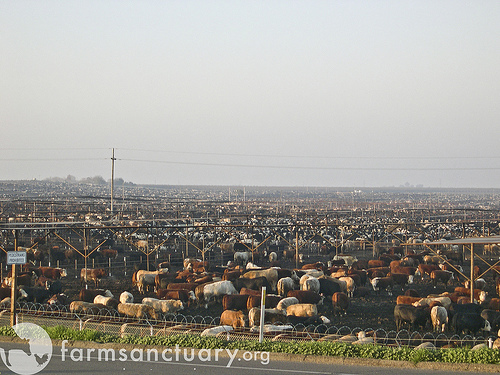 In addition, half of our potable water in the U.S. is used in raising animals for food. These are the plain and simple facts. Therefore, I'm wondering, can you be an environmentalist and still eat meat? So ... what's for dinner?